Last week my pal, Matt Smith, asked his email list about their biggest challenges when it comes to being focused and productive. He then shared the feedback with me and asked if I could give some input and advice to address some of the most common challenges. Matt got hundreds of responses, which is awesome. After combing through all the feedback, we noticed that the biggest challenges and frustrations fell into a couple of main categories. It’s split down the middle for those who work at a company office and those who work remotely (either at home or at their own office space). Nearly one-third of you work for yourself. 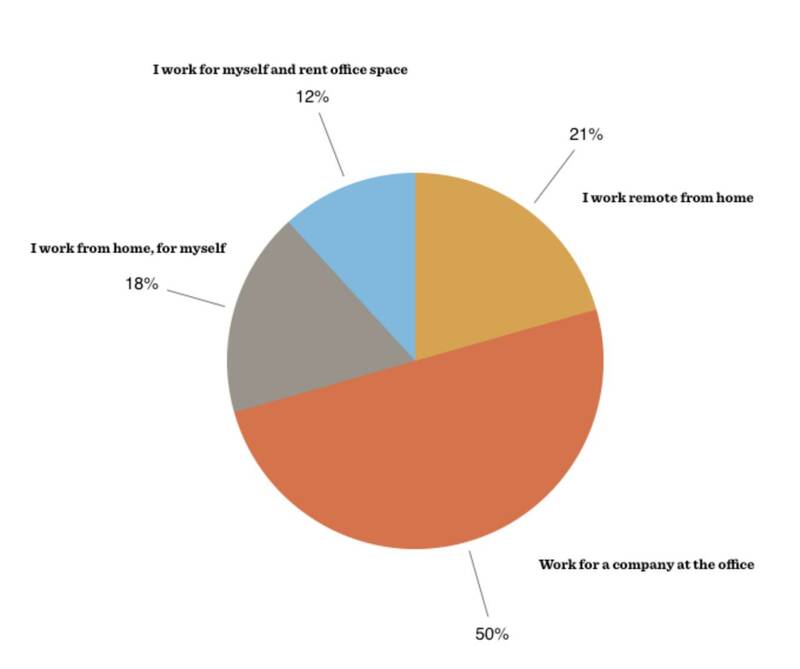 And of those who work for a company, nearly one-third of you work remotely. Dealing with Distractions: Such as incoming emails and notifications, being interrupted by co-workers and managers, and going to meetings. Also, many of you shared about getting side-tracked and being pulled into distractions such as checking Reddit, YouTube, etc. Struggling to Focus: By having other things on your mind, too many spinning plates, or just struggling to get (and stay) in the zone. Procrastination: Putting off a project, waiting to get started, and/or ignoring it until the last minute. This is a huge one, right? Especially when it comes to creative work. Which is why it ties in so much with the next category that we’ll get to in a minute. As Paul Graham wrote about in his famous article, Maker’s Schedule, Manager’s Schedule, a creative person needs chunks of long hours that are completely uninterrupted. It takes time to work up to that place where you’re really focused. 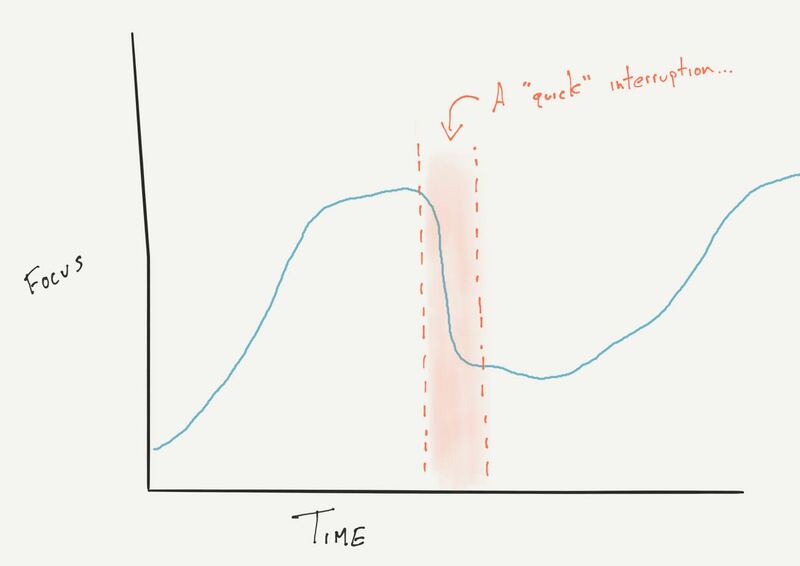 And when someone interrupts you for just a couple minutes (or you give in to your own distractions), it takes a significant amount of time to get back to the same level of focus you were just at. In addition to having un-distracted time, you also need to be confident that your time will be distraction free. 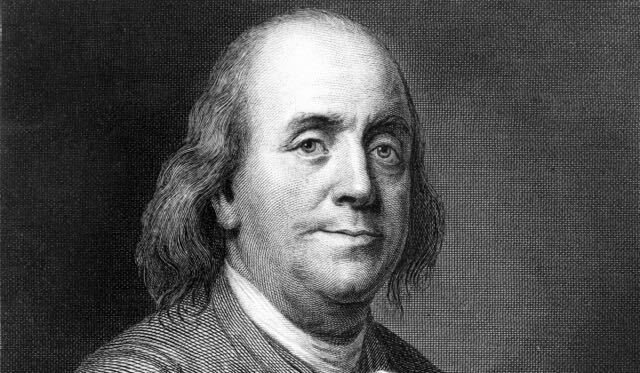 Merely having the anticipation of being distracted is like a leash that keeps us from diving into deep work. The back of our mind tells us that at any minute we could get tapped on the shoulder, or asked to come to a meeting, or our kids may barge into the office. So yes, by all means, if you find yourself getting distracted by email, slack, and other incoming notifications, then merely closing those applications will do wonders. For me, personally, I have my Mac and my iPhone both set to stay in Do Not Disturb mode until 11:00 am every day. I also don’t check email or social media before 11:00. This way, the first 3-4 hours of my work day are completely interruption-free. And since it’s on autopilot, I don’t even think about it. 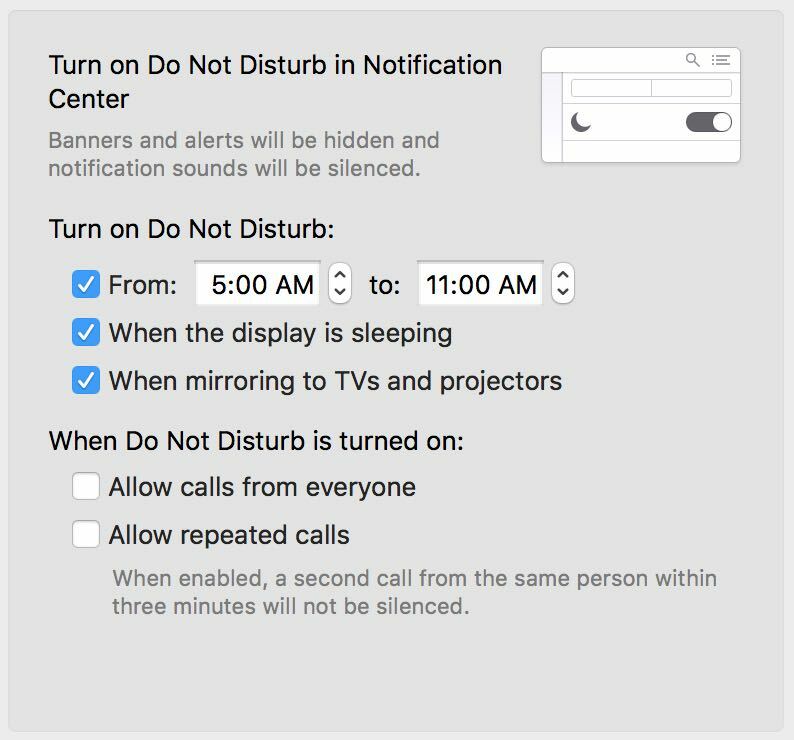 To set your own Mac’s Do Not Disturb schedule, just go to System Preferences → Notifications. While turning off email can help, it’s not the only distraction we face. I was talking to someone last year, and she told me that her office expects her to be available at any time, whatever their needs are. And, as a result, she can’t schedule time to do deep, focused work because they’ll frown upon her being ‘unavailable’ during that time. Therefore, she never knows how productive she’ll be in a day because she never knows how many interruptions there are going to be. 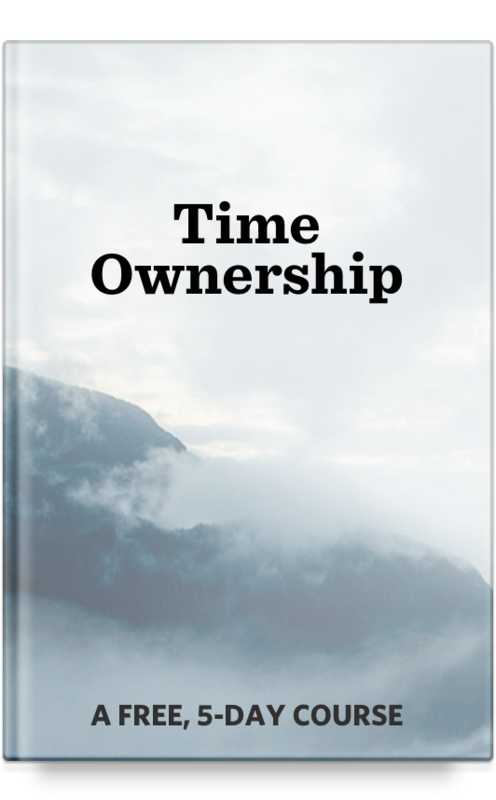 Take ownership of your work environment. What I mean by taking ownership of your work environment is that you’ve got to be proactive about cutting off distractions at the pass. Take a step back and see what things and people are causing you to be distracted in any given day. And also what distractions do you anticipate. Getting the distractions taken care of is a huge win. But how then can you ensure you’re staying focused on the task at hand and do your best work? Focus is a skill; a muscle. Which means you can develop and strengthen your ability to focus. How? The same way you would develop any other skill or muscle. You start simple and work your way up. The Pomodoro technique can be great for this. You set that timer for 20-minutes, give or take, and you work on one task during that time. You focus on that one thing and nothing else. Working in time blocks like this can also be liberating because you know there will be a stopping point. There’s a light at the end of the tunnel — you’ve set up a boundary for how long you’re going to focus on the singular task at hand. My mornings are divided into three or four, 55-minute blocks. I will focus on a task for 55 minutes, then take a 5-minute break to stretch and move around. Not only is focus a skill which you can develop, but there are also some fundamental things you can do to give yourself an advantage. Reducing the amount of non-trivial decisions you make each day. And (as we mentioned above) protecting your time and attention. With a few systems in place, you’re helping ensure that when it comes time to do the work you’ll be at peak performance, ready to rock and roll. For me, most days it’s easy to focus. Over the years I’ve worked hard to build a work environment that helps me stay focused and do my best creative work every day. But I sure do still have days when my mind is totally distracted. On those days when I’m majorly struggling to stay focused, I don’t sweat it. Because I know I have a system in place that helps me stay focused and productive 95% of the time. So the days when I’m struggling, I find something else do to instead — such as read, run errands, or take my boys to Chipotle. Optimize for the starting line. The systems that help you build that focus muscle, are the same systems that help you overcome procrastination. I begin each day of my life with a ritual: I wake up at 5:30AM, put on my workout clothes, my leg warmers, my sweatshirts, and my hat. I walk outside my Manhattan home, hail a taxi, and tell the driver to take me to the Pumping Iron gym at 91st Street and First Avenue, where I work out for two hours. The ritual is not the stretching and weight training I put my body through each morning at the gym; the ritual is the cab. The moment I tell the driver where to go I have completed the ritual. Twyla focuses on the starting line. She focuses on getting out the door and into the cab. That’s it. How much easier is it to get started when all you have to do is get dressed and go outside? Rather than focusing on finishing a goal (going to the gym for 2 hours), we are much better served when we focus on just getting started (walk outside and hail a cab). Because once you’ve begun moving, the momentum and routine will carry you quite far. Thus, do what you can to optimize the starting line and make it as easy as possible to just get going. This was one of the points my friend, James Clear, made during his session at the Craft + Commerce conference last month, and I love the way he framed it. He shared that in the beginning, what matters most is getting going and doing the repetition — focus on quantity rather than quality. Which means that every time you do a habit / routine you are moving forward toward the goal / outcome you want. It’s the small and regular steps that matter most. Thus you have to make it as easy as possible to start, because it’s in the doing that you are moving toward your goal. Therefore, optimize for the starting line rather than the finish line. Focus on getting started not finishing. Once you’ve gotten started, momentum will carry you further than you think. If you spend all your energy focusing on what it will look like to finish, you may never even get started in the first place. As Twyla wrote about, one of the best ways to optimize the starting line is through routine. Make it as easy as possible to just get started. This is the premise of my 5-minute rule, and it’s why I leave a note out for myself. But it’s important not to confuse strategy with vision. Build habits you’re proud of. Build habits that move you in the direction of your personal vision and values. That’s an entirely other topic, but I think Matt and I will be diving into in the weeks to come. If you’d like to read more, here are a few articles I’ve written that I think you’d find value in. Thanks. A few links here on working from home and being productive and creative.